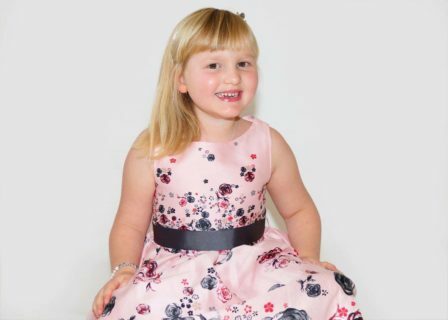 Jessica was diagnosed with DIPG ( a type of brain tumour) on 7th March 2011. Her mum, Lisa, shares her story to raise awareness for childhood brain tumour research. “Our Jessica was a beautiful, confident and happy little girl who lived her life to the full and had lots of friends. Life changed for Jessica and all those who knew her in March 2011 when Jessica was only 3 years old. “Jessica’s left eye had started to drift inwards. We weren’t worried about it, we just thought she would need glasses or an eye patch to correct it. We took her for an eye test and the optician confirmed her sight was fine but wanted to know the cause of the squint. He referred her to the Royal Bolton Hospital. “That appointment went well. We were told again that her eyesight was fine and the squint could easily be corrected but Jess would need a scan to find out the cause. We were given a follow up appointment for two weeks later. In those two weeks we noticed a big change in Jessica. She wasn’t blinking from her left eye very often and she couldn’t close it. She became clumsier, started banging into things and stumbling, and the left side of her mouth was weak. The symptoms came on all of a sudden and we were obviously very worried now. “We explained our concerns to the orthoptist and he referred her to the paediatrician straight away. Jessica was examined and we were told they wanted to do an MRI as soon as possible. When the consultant came into the room after the MRI, I knew it was bad news. Nothing can prepare you for hearing that your child has cancer. They couldn’t tell us much more and we were blue-lighted to The Royal Manchester Children’s hospital. “Our worst fears were realised. The following day when we were taken into a quiet room to be told that Jessica had a tumour in the worst possible place. It was in the brain stem. The tumour was inoperable and Jessica’s life expectancy was 9-12 months. There was little treatment they could offer, only treatment to prolong Jessica’s life and not cure her. “Jessica was started on steroids straight away to relieve some of the pressure on her brain and preparations began so she could start radiotherapy. In total Jessica received 30 fractions over a six-week period. I can’t begin to tell you how proud we were of her. She was so young and would lie completely still with her mask over her face and shoulders, which pinned her to the table so she could have her treatment. During the six weeks, Jess contracted chicken pox, so we had to have a three-day stay in hospital on top of daily radiotherapy sessions. She didn’t complain once. By the end of the six weeks, Jessica was no longer on steroids and her initial symptoms had improved. Weeks later, after a further MRI, we were told that the tumour had reduced by about half the size. We were over the moon. “In October 2013 we began to see signs that something wasn’t quite right. Jessica’s left eye began to drift inwards again and she was slightly off balance at times. Jessica was referred for an MRI and our worst fears came back. The tumour had started to grow again this time more aggressively than before. We knew there still wasn’t a cure. We hoped that Jessica would be accepted on a new experimental treatment at Bristol but the tumour took hold of her quickly and in a matter of days Jessica became very weak. She was unable to walk, had difficulty moving her right side and couldn’t swallow. Jess was admitted and put on a high dose of steroids and things improved again. “Our only option was to start chemotherapy at this stage. Jess had fought for too long for us just to give up. The next few months were like being on a roller coaster. Jessica would be doing well so her steroids would be gradually reduced and frustratingly she would become unwell again. The chemotherapy and steroids were causing her further side effects and we had many overnight stays in hospital due to getting infections or needing blood products. Jessica continued to be brave through all of this and her strength is what pulled our family through such a difficult time. “In March we made the decision to stop her treatment. The tumour was continuing to grow with the chemotherapy and we didn’t want her to suffer any more. Jessica became unwell and developed a chest infection. She required 24 hour care so we decided to take her to Derian House children’s hospice. Each day Jessica became weaker and lost the ability to do something else. She could no longer walk, talk, swallow or move any part of her body. The only way she could communicate was with her eyes. She was fed by an NG tube and she didn’t have any quality of life. The cruel thing was that Jessica knew exactly what was happening to her little body.